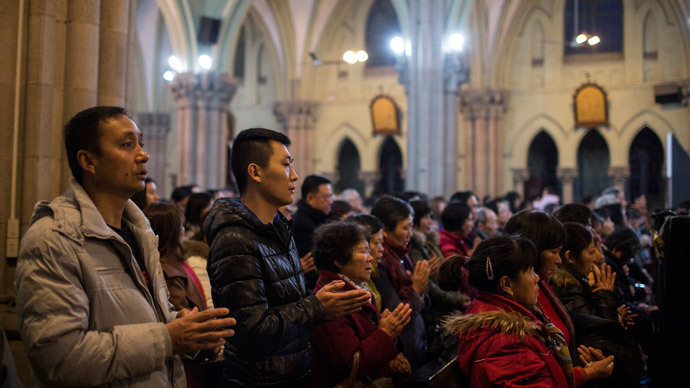 Catholic and Protestant leaders in China have criticized legislation drafted by Zhejiang province, home to a large Christian community, to reduce the quantity of Church crosses across the province and ban their placement on rooftops. The law “blasphemes the foundational belief of Christianity” and violates China’s constitution in respect to freedom of religious belief, Chongyi Church, the largest Protestant church in Zhejiang’s provincial capital Hangzhou, said in an outraged statement. Chinese authorities have forcibly removed at least 470 crosses, and destroyed over 35 churches over the past 18 months, estimates Chin’s UCA news website. Clashes with local Christians were often the result of authorities’ actions. Authorities claim that the draft legislation, which sets restrictions on Christian churches, mosques and Buddhist and Daoist temples “protects freedom of religious belief”. The bill stipulates that a cross of a church must be placed on the building’s facade, not on the roof top, should blend in colour with the whole of the building and should be no more than a tenth of the building’s height. The provisions of the law, open for discussion until May 20, have sparked public criticism of the authorities, which is rare in China. “It is quite standard around the world that the cross is placed on the rooftop. How can we just fix it on the facade? It’s difficult for us to accept,” a Catholic priest, who asked to remain anonymous, told UCA news portal. “Under such circumstances, we may have to build our churches in the Chinese temple style in the future,” he added. Another worshiper, a Protestant catechist, said that the new legislation demonstrated that the Communist Party is set to interfere in the matters of religion. The 36-page draft also stated that kitchens and bathrooms in churches are bound to primarily use solar or other renewable energy. The latter is an expensive requirement, which has never been imposed on other businesses and institutions in China. “It is simply ridiculous. The authorities should control the smog first before talking to the Church about environmental protection,” the catechist, who also asked not to be named, said.